Tank setup: A few rock caves and a sandy substrate. Well pre-soaked bogwood can be included, as long as the water is sufficiently buffered. 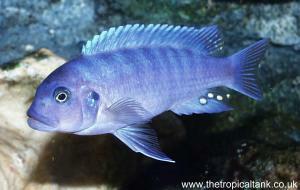 Compatibility: A moderately aggressive species, combine with similar Malawi mbuna. Water chemistry: Hard and alkaline: pH 7.6-8.6 ; GH 7 plus ; KH 10-12 ideally, but at least 5-6. Feeding: Omnivore: feed flake, granular and frozen foods, include a vegetable component. 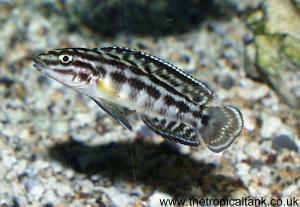 Sexing: Males and females have almost identical colouration, adult males will generally have brighter colours. Breeding: Mouthbrooder, see general article linked below. 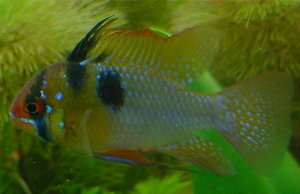 Comments: There is another colour variation of this fish, commonly known as the white-tailed acei or Pseudotropheus acei "Ngara". 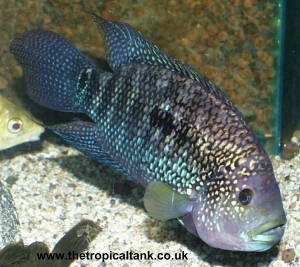 See also the Malawi mbuna section for more detailed info on keeping and breeding the Malawi mbuna cichlids.